If there ever comes a time to be truly adventurous in Europe, study abroad students may go backpacking through the alps or go bungie jumping/sky diving to feel like a thrill-seeker after spending so much time hopping around museums and monuments. I’m not one for heights, so my version of an “adventure” usually doesn’t involve jumping out of planes. No, this next adventure was rather something done on a whim and without much thought–but ended up being the most memorable experience of my semester abroad (thus far). For our final travel break of the semester, some friends and I were debating what cities to see after visiting Berlin and Prague. Once we had decided to go see Vienna, we wanted to squeeze in one other destination–just for the sake of getting to say we went to four countries in eight days. If only border control still existed in Europe and passports still got stamped when traveling in between countries…oh well. As I was saying, we were looking for one other city to visit. 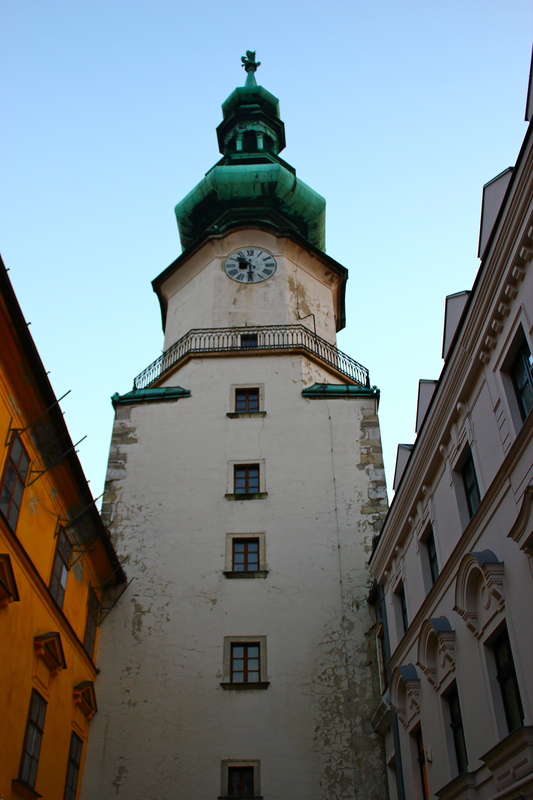 My friend Jackie then suggested we go to the capital city of Slovakia: Bratislava. Having Slovakian heritage, she really wanted to see the country where her family lived for many generations. The pros were that it was relatively cheap compared to other cities (though Slovakia is now on the euro), and a 40 minute bus ride from Bratislava gets you to Vienna for only 7 euros. So we went for it. 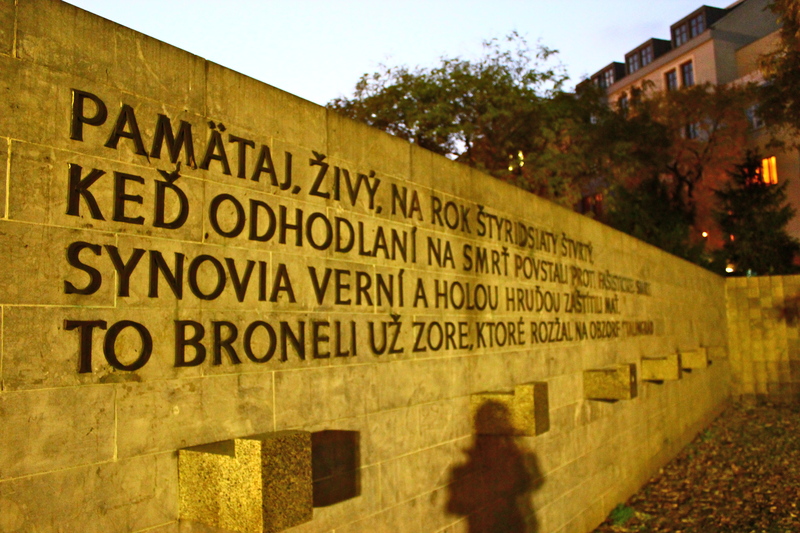 To tell the truth, I didn’t know a whole lot about Bratislava, and what I did know failed to get me excited about going. 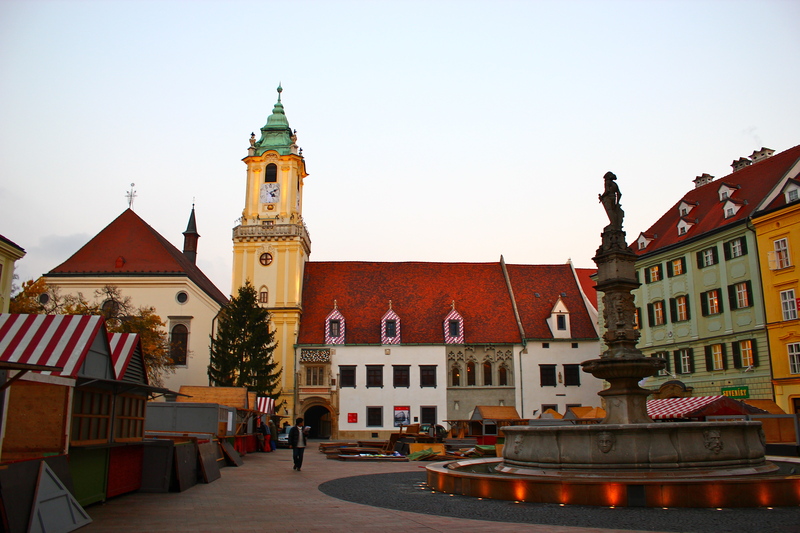 Granted, movies like Eurotrip and Hostel grossly exaggerate Slovakia’s underdevelopment (as a post-communist state, it has actually experienced a very high level of economic growth in the last 20 years) and poorly represent social and cultural institutions of Bratislava specifically. 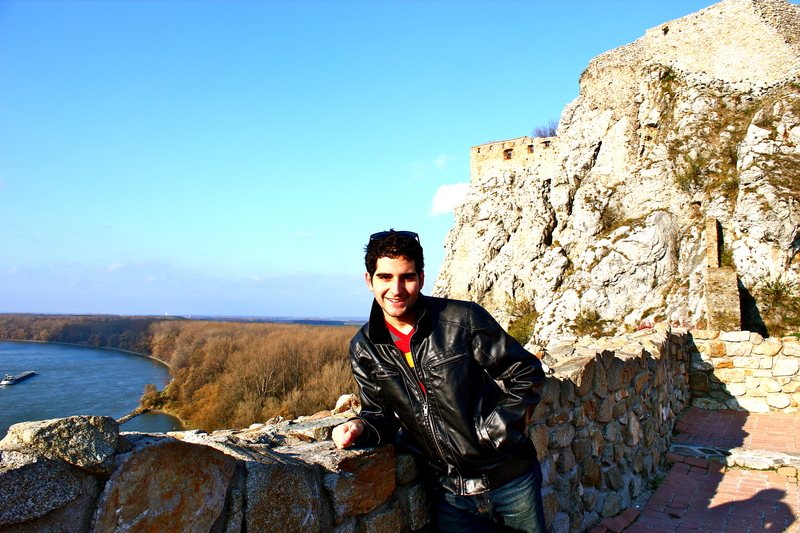 Yet, having traveled earlier in the semester to Estonia (another post-communist state), I knew the challenges of traveling to an underdeveloped place, and the language barrier definitely concerned me. But in the spirit of adventure and memory-making (for better or worse), I figured why not give it a visit. Upon arriving at Bratislava’s central train station, chaos was among us. All the locals were staring at these three visibly lost Americans who clearly had no idea where to begin to orient ourselves. We knew we had to catch a bus to get to our hostel, but we knew neither which bus to take nor where the bus stop was located. After navigating through this surprisingly overcrowded train station, we asked a countless number of train station employees for directions to the bus stop. It became very clear rather quickly that the English language is not commonly used in Slovakia. No one seemed capable of helping us because they simply could not understand us. We wandered around until we eventually found what we believed to be the bus stop. After locating a bus map, we figured out which bus to take, and we boarded an incredibly crowded bus with our luggage en route to our hostel. This bus ride made me feel like I was part of a police chase. Aside from the winding, multiple-lane roads throughout Bratislava that are not exactly driver-friendly, the conductor was being a little too liberal with the accelerator. When he’d make sudden stops, our suitcases (and the people standing on the bus) would fly around uncontrollably, like insects trapped in a mason jar, desperate for air. Despite being tossed around Bratislava public transportation like inanimate objects, no one seemed to bat an eye at this NASCAR-wanna be bus driver. Turns out that this sort of thing is pretty standard in Bratislava during rush hour when traffic builds up, and the busses teem with commuters. We eventually find our hostel, which ended up being very nice and only a few blocks away from Old Town–the touristy center of Bratislava. By this point, however, we only had a couple of hours of daylight left, leaving us with very little time to see much of the Old Town before sunset. After grabbing a quick lunch, we made our way towards Old Town to wander. In all honesty, we didn’t have much of a plan. We figured Bratislava would be small enough to just get recommendations of what to see from a tourist map or from a receptionist at the hostel. Walking around Old Town Bratislava made me feel like I was in Tallinn again: a very old, quaint town encapsulated by a developing city attempting to scrub away the memories of communism. The Slovakians, in my opinion, felt much more content to be living in Bratislava than the Estonians living in Tallinn. Unlike Estonia, many younger people do not leave Slovakia to go work elsewhere in Europe, a good indicator of the quality of life in Bratislava. 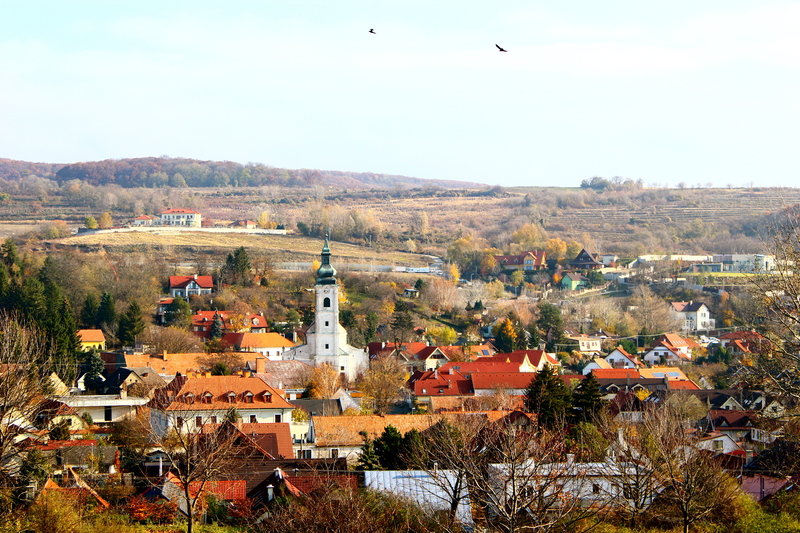 As pretty as Old Town Bratislava was, there wasn’t a whole lot happening. There was good cheap shopping, pretty churches, a couple interesting memorials, stands being set up for an upcoming Christmas market, and delicious smells from the local restaurants. 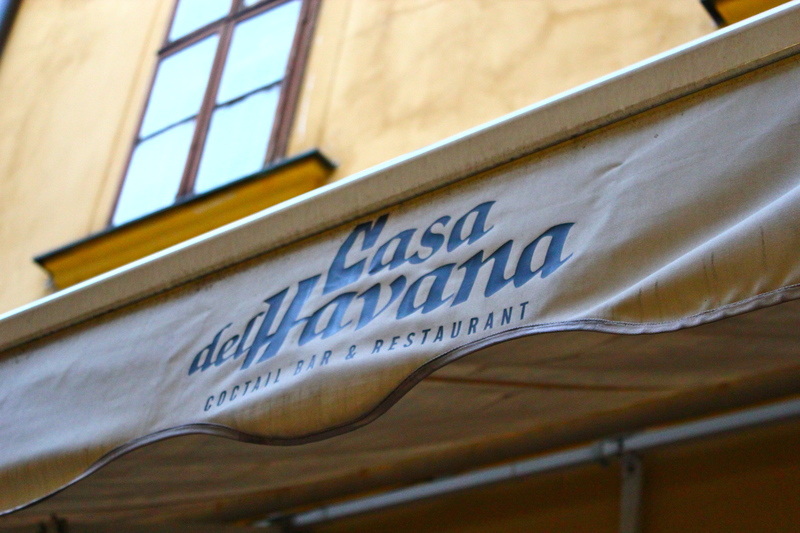 And of all places to find a Cuban restaurant in Europe, I find my first one in Bratislava. Who would’ve thought?! 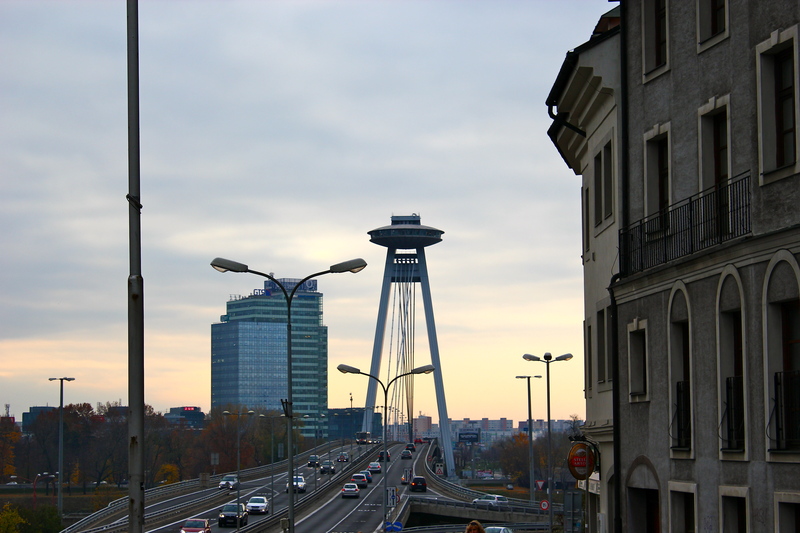 But as I was saying, there wasn’t a whole lot of activity on this cold November afternoon in Bratislava. After about 2 and a half hours of walking around aimlessly, we headed back to the hostel to do some research on where to get a scrumptious dinner for a reasonable price. Good thing Bratislava has some excellent breweries, and right down the street from our hostel was a local brewery that the hostel receptionist recommended we go check out. The beer was unreal. And the food was amazing. Glad the day got to end on that note. We had one more day in Bratislava, and I was already a bit concerned about finding something to occupy our day. My friend Jackie had read somewhere online about this castle 20 minutes outside the city that is apparently one of the oldest castles in Europe, and on sunny days, you can see Austrian and Hungarian territory. As cool as it sounded, I was a bit skeptical. We hadn’t done much research, and it looked like the castle pretty much shuts down for business after October. However, Jackie was persistent about going to this castle, the Hrad Devín as it’s called, and she wouldn’t take no for an answer. 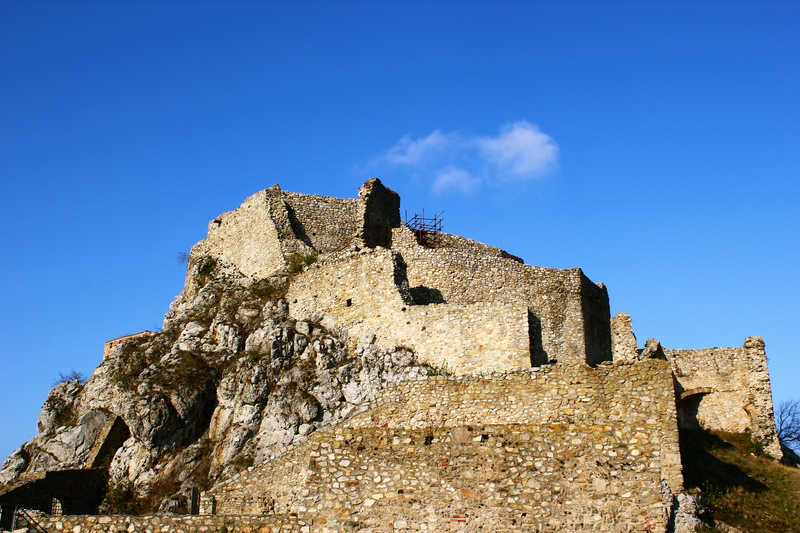 As if visiting Bratislava on a whim wasn’t enough of an adventure, I found myself on a bus the next morning heading towards the town of Devín in rural Slovakia to check out this castle. I’m a pretty defensive person. I hate admitting when I’m wrong. It’s a character flaw, I know. And this was absolutely one of those times where my judgments would’ve strayed me away from an incredibly memorable experiences. Because by the time I had finished seeing the castle, I had trouble thinking of something that had floored me more so in my entire life than this castle. 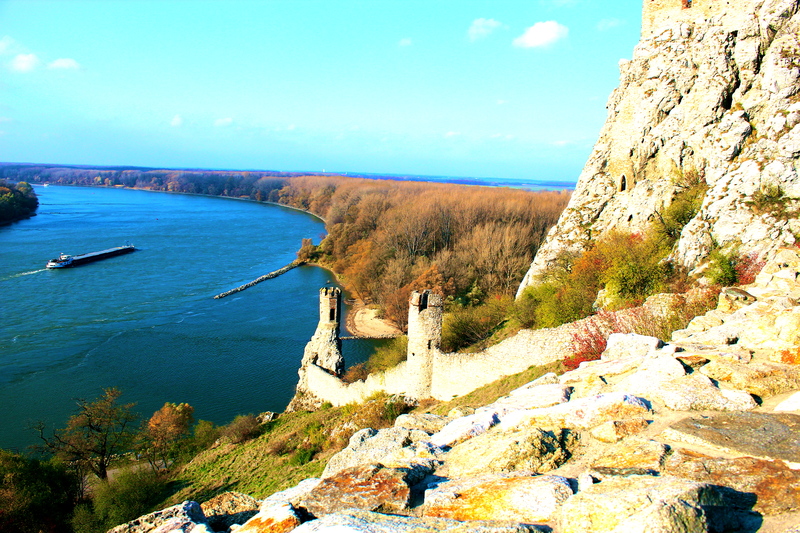 Unbeknownst to me, the castle lies on a hill right on the Danube river–trapped in between the beautiful rolling hills filled with green grass and trees with leaves in the full fall colors. 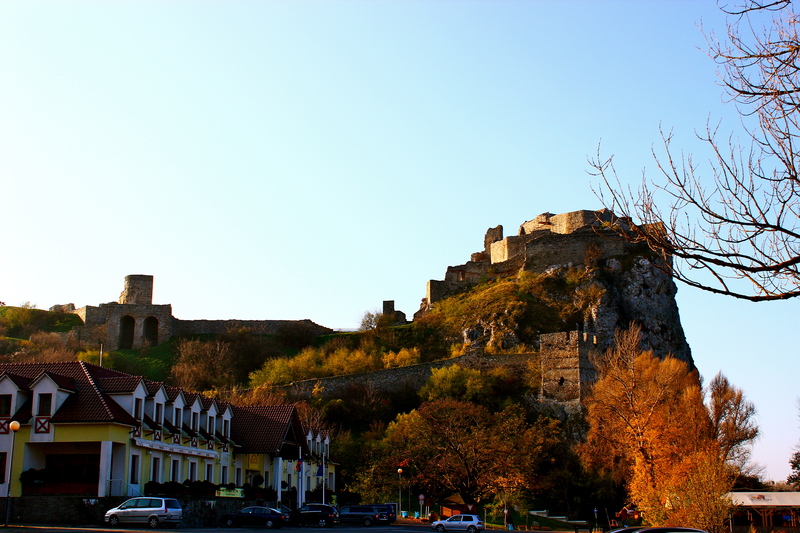 A Slavic castle, Hrad Devín was built as early as the 8th Century at a strategic intersection between the Moravian and Frank empires. Made entirely out of stone, the castle has definitely had its years. Perhaps it was the teetering façades or the authenticity of the ruins that made the castle feel untouched, yearning to be explored. I found myself reminiscing of my childhood, a time in my life when exploring the unexplored would do nothing short of putting the biggest smile on my face. As the sun beamed out onto the hills of Devín and onto the Danube, not an instant was spared without a camera in hand in an effort to helplessly capture the memories. I was experiencing unadulterated joy much like a child does, with no conception of time or space. It was no longer Europe, or Slovakia, or Devín Castle. It was an experience so much detached from the physical location. And all my focus was on the wonder of it all. 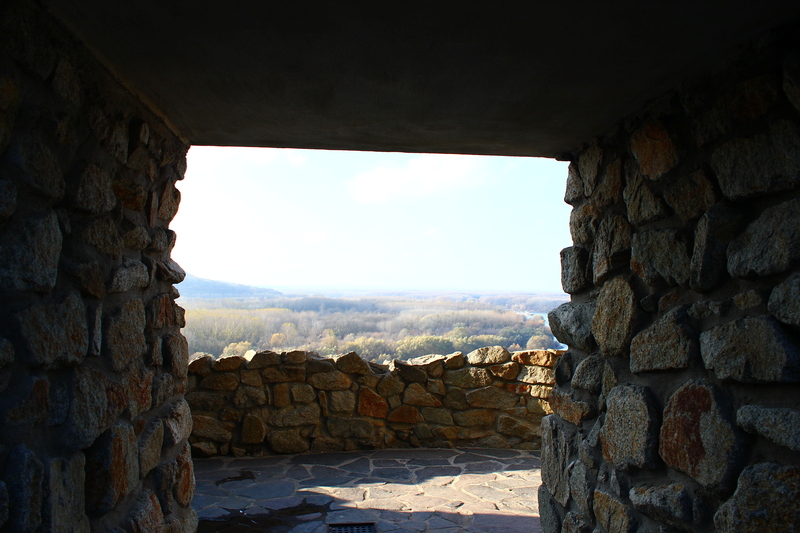 As much as I talk up my visit to the castle, Bratislava itself did have its own little surprises. People generally refer to Berlin as the street art capital of Europe, but in my opinion, Berlin wall art had nothing on the vivid, thought-provoking street art scattered all around Bratislava. So, in the end, Bratislava was 100% worth it. As much as I trust my own judgment, I know now sometimes it’s just better to put your trust into other people. As uneventful as our first day had been, our visit to Devín made the entire trip to Bratislava worth all the words that got lost in translation. Next stop, Vienna!